AvPlan EFB 6.0 is now available in the App Store as a free update for all subscribers. We’ve packed a lot into this release, and we know you will love what we have done. The Weather/NOTAM page on Terminal has been renovated, with decoded TAF and METAR available. We highlight the current period in a TAF and any applicable INTER or TEMPO periods as well. At the bottom of the TAF and METAR table, the weather for nearby locations is also displayed. On the En Route pane, the METAR overlay is more prominent, and you can tap on a METAR to view the decoded information. We have also expanded the available weather overlays, adding a Medium and High Level SIGWX map overlay. The SIGMET overlay has had a renovation as well; Icing SIGMETs are blue, Turbulence SIGMETs are orange and AIRMETs are purple. The weather system within AvPlan EFB has had a major update, and with our SmartRadar technology, will download and cache weather radar imagery as you fly. This will then be available if your device happens to be offline at the time you want to view the weather ahead. SmartRadar is even smart enough to check for new data when your network becomes available. We have added support for pretty much every commercially available external WiFi connected GPS/ADSB receiver available today (Sagetech Clarity, iLevil, FreeFlight, SkyRadar, NavWorx, Pathfinder and more). Expect to see Dual XGPS170 & 190 support in our next release. Not all these devices work outside the USA (and ADSB weather is not available outside the USA either), so check for ‘dual band’ or ‘1090es’ support for those pilots flying outside the US. 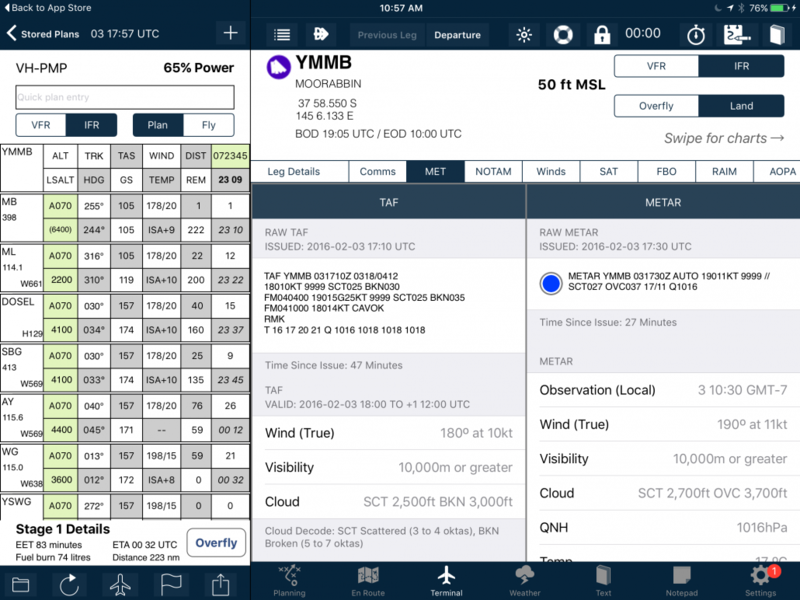 In the USA the supported devices will show ADSB weather (NEXRAD, TAF, METAR etc), traffic and GPS location. Additionally, AvPlan EFB 6.0 supports two types of ADSB devices you can build yourself. The ADSB-pi supports ADSB traffic only, and we also support the ‘Stratux‘ ADSB device. The Stratux can have GPS, ADSB traffic and AHRS on the one device so makes it far superior to the ADSB-pi. For commercial operators, flying clubs and other groups we have created AvPlan Cloud. AvPlan Cloud is a way of managing multiple devices, reporting on the state of the software and data on these devices, tracking location, group subscriptions and even adding custom maps to these devices. AvPlan Cloud will make the lives of the EFB Administrator in your organisation a whole lot easier. AvPlan EFB 6.0 now has a much higher resolution, online only, satellite map. Any areas you view while online will be available to view when offline. For US pilots, CSC DUAT has been deprecated and AvPlan EFB now uses Lockheed Martin FSS for briefings and flight plan submission. Briefings can be in both plain text and raw formats as desired. AvPlan EFB now includes a much improved navigation data overlay. Airports, ALAs/Private Airfields, HLS, Navaids, IFR and VFR waypoints can be selectively overlaid on all maps. These objects all declutter when zoomed out. There are also labels (showing name, height AMSL and CTAF for airports, name and frequency for navaids) which rotate as the map is rotated. AvPlan EFB 6.0 can now perform critical point calculations and will show you a critical point for normal and non-normal operations. This feature is available for those with a Pro subscription. Lastly, the internal navigation database within AvPlan EFB has been put on a diet. If you have only one region selected (Australia for example), the database size is less than 4 times the original size. Support for the iPad Pro & preliminary support for App Multitasking in iOS9. The maps themselves load a whole lot faster. Font fixes to stop ‘…’ appearing randomly. When importing flight plans, an issue where user waypoints could be duplicated is now resolved.